Here are seven Bible verses that may help you in adapting to a new place, job, or some other major change in your life. Whenever we live a life that is hard and strewn with difficulties, and yet we are contented, this is most pleasing to God. When we can adapt to circumstances and still give God praises and glory for His goodness, our God is well pleased, but when we are discontent with our circumstances, then we tell God, we are not satisfied with Him because He is sovereign over all that happens to us. Don’t let circumstances rob you of your joy because your joy (and mine) isn’t dependent upon what happens in life, good or bad, but by what Jesus Christ has done for us. The Apostle Paul adapted his gospel presentation to the audience that he was sharing it with. One example that I can think of was when I was witnessing to some Jews in a mall who had a small kiosk. Instead of talking them down the Romans Road, I went through the commandments of God listed in Exodus 20 and asked, “How often have you broken these commandments of God” (like I have), and “What does the Bible teach that happens to all lawbreakers?” There were two Orthodox Jews that I spoke with so I tried to do what Paul did, “to become all things to all men,” whether it was a Jew, a Muslim, or a non-believer. He adapted his message to the audience he was speaking with and with great effectiveness. If we’re not being conformed into the image of God by the renewing of our mind by God’s Spirit, then we’re being conformed into the image of the world. It is either one or the other. The word “conformed” simply means “with pressure” so the verse could be said like this; “Don’t let the world squeeze you into its own mold.” I need the renewal of my mind in order to have the adaptability to be an effective witness for Christ in order to be transformed into the image of Christ, and that’s God’s goal for all of us. Once again, Paul speaks about being able to please those with whom he meets and not trying to take advantage of his apostleship to the Gentiles. He is trying to please everyone in everything he does, but that doesn’t mean Paul was trying to be a people-pleaser. On the contrary, most of the Jews and some of the Greeks were not pleased with Paul at all, so it’s not that Paul was compromising his beliefs or his evangelization, but rather, he was trying to please others so that he might have a chance to share the gospel in the hopes that they might be saved. His goal was not to be popular, but to rescue the perishing. For anyone that’s going to have to go through a major change in life or is going through one now, King Solomon in his wisdom literature, the Book of Ecclesiastes, says that for everything that happens to us, there is a time to do it and a time not too, but also, there is a precise time for everything that happens under heaven, meaning under God’s sovereignty. The words, “under heaven” is simply an acknowledgement of the sovereignty of God and that all He does is always at the exact time in our lives, whether we feel like it is or not. In Romans chapter 8, Paul is encouraging the church at Rome to understand that whatever happens is part of God’s will, either good or bad. It doesn’t mean that only the good things are according to His purpose, but all things, both good and bad, will work out for God’s purpose and always for our best. 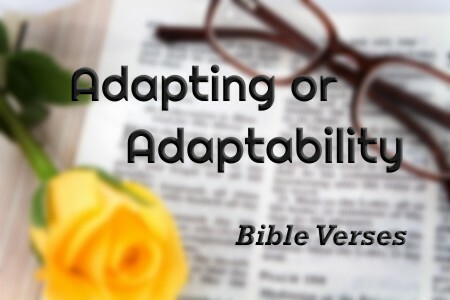 It’s like Joseph telling his brothers that what they meant for evil, God intended it for good (Gen 50:20), so whatever you have to adapt to in this life, know that God is going to use it for His purpose and for your ultimate good. If we think about what Jesus had to go through, having to empty Himself of His divinity for a time, and then entering into human flesh to become the God-Man (John 1:14), we should strive to be more humble and not think more highly of ourselves that we ought to (Rom 12:3). This is the great humility that Jesus showed us and should be an example for us to live by. He Who was God Himself “humbled himself by becoming obedient to the point of death,” and instead of trying to be served, He came to serve and give His life as a ransom for many, so we also ought to be a servant to all in humility that seeks the best for others and never for self. Jesus adopted His nature into that of being both God and Man, coming to be born of a virgin, and being born into the flesh so that He would be able to atone for the sins of those who God brings to repentance and trust in Christ. If we can understand the purpose and nature of Jesus’ mission on earth (Mark 1:15), and that it required the greatest adaptability of anyone in human history, then we can see that whatever happens to us in life is designed to conform us into His own image. That is His purpose; to seek a people for Himself that they might glorify Him in their lives, because He says, “I will be their God and they shall be my people” (Jer 32:28), and those of us who are His people would be like He is, and if we want to see the supreme example of who God wants us to be, we need look no further than Jesus Christ. Thanks, Pastor Jack, for continuing to write these articles. I know you do what you do for God, and I know that you are too humble to take any credit for your efforts, although they are truly great. I know there are many of us reading these who don’t take the time or feel too unlearned in the Word to comment, but I think I speak for many when I say you are appreciated. I just looked at the time, and since it’s Wednesday evening, I’d bet right now you are on you way to or already at church preparing to deliver a message. May God always bless you with the health, energy and financial support to carry on for Him. Wow…what an encouragement. Yes, headed for Bible study at 730. Very much appreciate the prayers sir, more than you might know, for, as you said, “health, energy and financial support to carry on for Him” but only if it glorifies Him, otherwise, I am doing it in vain. May God richly bless you sir for your Barnabas-like words. Previous post: Who Was King Solomon in the Bible? Next post: How Do Christians View Stem Cell Research?